This is a picture I drew for an art contest I was in back in Jan '06 on Gaia. Anyways, I like how this picture turned out. XD; And no, I don't remember which place I came in... Though I think it was 2nd. Views 1417 Reference Naruto Episode 3? well, i'm from america and i have to say, yeah, we are pretty stupid. i mean, it's a frikken kiss!! and also, naruto has such an obnoxious voice in dubbed. BELIEVE IT! haha, srry bout that. great pic! this is really cool! 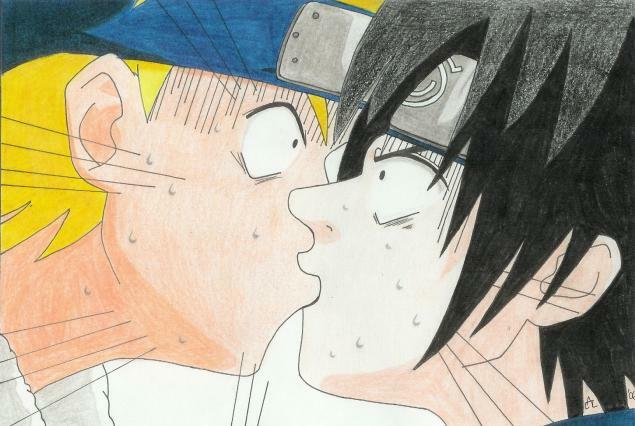 have you noticed the origional picture Naruto didn't have any wiskers?!?!?! GREAT JOB! !i RELLE LOVE HOW YOU DiD THE SHADiNG ON THE EYES!! omgg i remember that part ! nice job, i love thier expressions !